President Trump thinks he can boost Republicans next Tuesday by promising a new round of tax relief for the middle class. I’m skeptical of his sincerity, as noted in this segment from a recent interview, but I also warn that his proposed tax cut is impractical because Republicans have done a lousy job on spending. And I also point out that it is ironic that Trump is urging lower taxes for the middle class when his protectionist tariffs (trade taxes) are hurting the same people. At first, I wasn’t going to bother writing about this topic for the simple reason that Trump isn’t serious (if he was, he wouldn’t have meekly allowed the big spenders to bust the spending caps). But then I saw that Tom Giovanetti of the Institute for Policy Innovation wrote a column for the Wall Street Journal explaining how reforming Social Security would be great news for lower- and middle-income taxpayers. …44% of Americans no longer pay any federal income tax at all, and many more pay very little. …On the other hand, low- and middle-income workers do send the government a large share of their earnings in the form of payroll taxes. That same family of four pays $12,240 at the 15.3% combined rate for Social Security and Medicare. If you want to cut taxes for middle-class and low-income workers, that’s where you have to do it. …instead of…a payroll-tax cut of 4% of income, why not redirect that same 4% into personal retirement accounts for every worker? …With no decline in disposable income, American workers would suddenly be investing for retirement at market rates in accounts they own and control, instead of relying on Congress to keep Social Security solvent. Not only would personal retirement accounts be good for workers, they also would help deal with the looming entitlement crisis. America’s entitlements are on a path to collapse, and few politicians—including Mr. Trump—have an appetite to do anything about it. When the crisis comes, no tax increase will be big enough to solve the problem. Knowing the U.S. government is eventually going to fudge its commitment to retirees, policy makers should at least give workers a fair chance to amass the savings they will need to support themselves. The back-door solution to the entitlement crisis is to make workers wealthy. Will you worry about Social Security’s solvency or a Medicare collapse if you have more than enough money in a real retirement account to buy a generous annuity and cover your health insurance? At the risk of stating the obvious, this is the right approach. Both for workers and the country. To be sure, I don’t think it’s likely since Trump opposes sensible entitlement reform. But Tom’s column at least provides a teaching moment. I’m not sure when we’ll have a chance to address this simmering crisis. 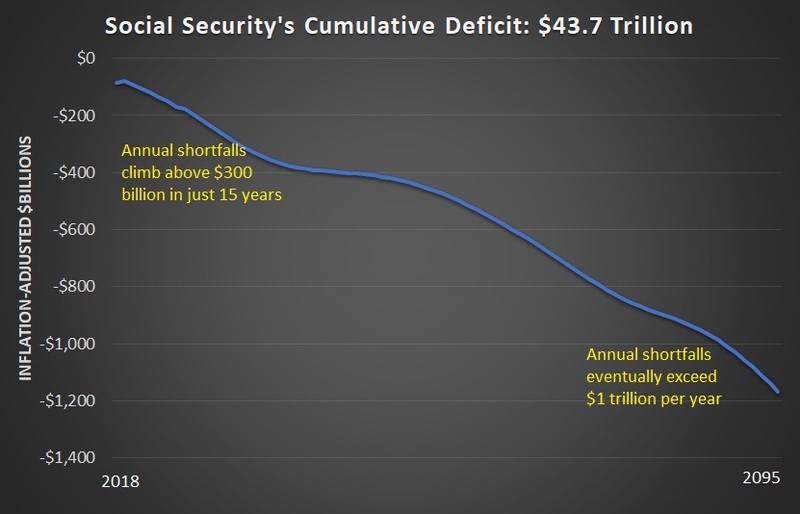 But if you’re wondering whether changes are necessary, check out this chart I put together earlier this year showing Social Security’s annual shortfall (adjusted for inflation, so we’re comparing apples-to-apples). P.S. This video has more details on the benefits of personal retirement accounts. P.P.S. And this video shows why the left’s plan to “fix” Social Security would be so destructive. Just for the moment, let’s assume the we move to a UBI and a Flat Tax. Approximately 1/2 of Social Security benefits would be replaced $ for $, for no net change. FICA would end and those at the low end would not be squeezed for SS payments, which would become a general expense. Seniors past retirement age would be fully vested, and would not see change in the net retirement amount. Those not yet reaching retirement age would only be partially vested. For every three months, until previous retirement age, their retirement age would be pushed back one month. This would only save about $12 billion in the first year, but it would decrease future liability by $700 billion. Eventually retirement age would reflect the expected life span (unless medical improvements occur faster then increasing retirement age). We would not be able to lower taxes in the first years, because of the deficit, but eventually tax reduction money could be deposited in private accounts, earning a higher rate of return. At minimum, people would still have the UBI to count on, if everything went to hell. When Social Insurance was introduced by Bismark, in 1879, the retirement age was 70, while life span for those that survived child birth was 48. Retirement age is now 66, while expected life span is almost 79.